Many earth fill dams are built with a geomembrane on the upstream face to prevent seepage through the dam. 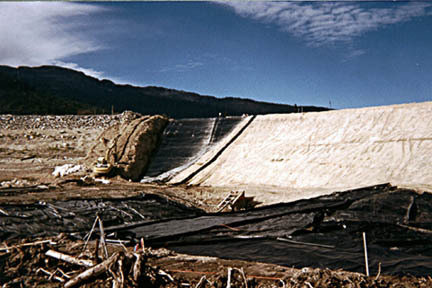 Layfield can provide dam facing liners for all earth fill dams including tailings dams and water control dams. Layfield has also provided retrofit liners to rehabilitate existing earth fill dams or to extend the height of tailings dams. Featured products for dam liners are our textured geomembranes including our Enviro Liner and HDPE textured materials. Textured materials provide better friction angles to maintain soil backfill on dam facings. Large earth fill dams also use prefabricated vertical drains (wick drains) to help with consolidation and stability. Layfield can install vertical drains for dam projects.